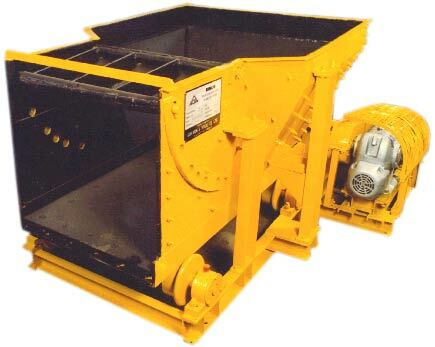 The SISCO FR-series Reciprocating Plate Feeders are utilized for primary feeding of the pre-crushed materials such as gravelly alluvial or mountain quarry & mineral ores even if large sizes are involved. These sturdy constructed machines are subjected to heavy duty use. After the main storage bin id filled up, the complete load of the material comes on the feeder. �SISCO� FR-series Reciprocating Plate Feeders are so designed that it can be started on load. They are essentially composed of an under frame on which the feeding base plate is supported by means of steel rollers, which alternatively slides backward and forward, causing the material to move forward. The alternative stroke of the base plate is adjustable and it receives its motion by a connecting rod-crank system driven by a motor and reducer unit. The discharge opening can also be adjusted by a door. It consists of two angular side frames connected by a bottom plate. The main feeder base is a special anti-abrasive steel liner which is bolted to the bottom plate. Wooden blocks are bolted in between the Feeder base plates and the bottom plate, which acts as a shock absorber and resists sufficient thrust of the feeding materials. Two pairs of rollers slides backward and forward on the main chassis. Two rollers are connected by a harder steel shaft, which runs within two anti-friction bearings. The hopper is designed to store & guide the feeding materials properly and to resist the initial thrust of the rocks or ores. It�s inner surface is protected with anti-abrasive liner. The hopper door can be adjusted to control primary feeding. The drive is direct from a motor & reducer unit by means of chain & sprockets.